Summary: The São Roque Museum is located adjoining to the wonderful São Roque Church, situated in the typical Bairro Alto old quarter, in the heart of the historical centre of cosmopolitan Lisbon. 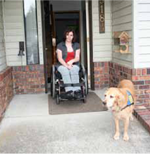 Summary: This is another residential X3 installation, allowing for much greater independence for a wheelchair user. 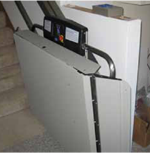 Summary: This X3 inclined platform lift represents a very typical residential installation. 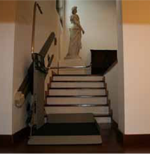 The X3 takes up minimal space while providing reliable transportation between floors for people who have difficulty using stairs. 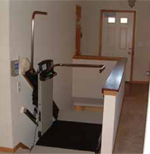 Summary: This is a typical X3 residential inclined wheelchair lift installation, providing much-needed accessibility to the family basement.